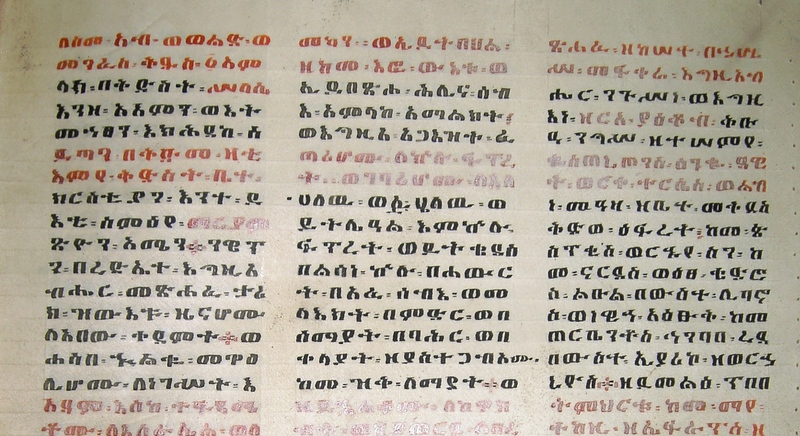 Parchment page from Ge’ez world history book, housed at Ethiopian National Library. Photo courtesy of Fisseha Tadesse. Ge’ez is an ancient Semitic language once spoken in the area that is now northern Ethiopia and southern Eritrea. Ge’ez went extinct as a natural language over 1000 years ago and is no longer spoken as the native tongue of any people. Ge’ez continues to live, however, as the liturgical language of the Ethiopian and Eritrean Orthodox Tewahedo Churches. Religious leaders and scholars study Ge’ez in order to read and interpret old texts. Unlike other extinct languages that are studied only in such an academic context, however, Ge’ez is actively spoken within the church community. Students attend Qene Bet (poetry school) where they learn not only to read but to compose new works and engage in spontaneous conversation. Toronto is home to a small community of Ge’ez speakers, and several churches in the city regularly use Ge’ez in their services. Toronto resident Fisseha Tadesse, a scholar of the language who collaborated with ELA Toronto on our Ge’ez project, is actively involved in promoting the use of Ge’ez in the city and around the world and runs the website Ge’ez Online. The first video below is a short documentary entitled “Ge’ez: Life of a Dead Language” which features Fisseha discussing his personal experience with the language. The video is mainly in English with some Ge’ez portions. The second video is a conversation, conducted in Ge’ez, between Fisseha and local priest M.H. Haregewoin, in which they discuss their thoughts on the status of Ge’ez today.